Spacewalker Tim Kopra works in the payload bay of space shuttle Endeavour as the International Space Station’s Canadarm2 robotic arm hands the Japanese Exposed Facility to the shuttle’s Canadarm robotic arm. This story was updated at 9:49 p.m. EDT. Spacewalkers and robotic arm operators attached the finalpiece of the International Space Station's Japanese Kibo laboratory - anexposed platform for science experiments. The addition completes the $1billion Kibo complex, the station's largest lab, and allows researchers totest how different materials react to the harsh space environment. "The Japanese Exposed Facility, or 'Jeff' as we tend tocall it, is very impressive," said lead spacewalker Dave Wolf in apreflight interview. "It?s a largeexternal porch to the space station where high quality experiments can beconducted in high vacuum of space. It?s really an exceptionally valuable pieceof real estate being produced in outer space." 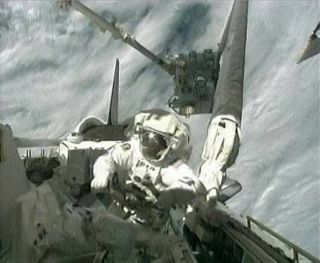 Wolf and Tim Kopra began the spacewalk at 12:19 a.m. EDT(1619 GMT), and concluded it about five and a half hours later. The event wasthe first of five spacewalks during the shuttle Endeavour's STS-127 mission.Endeavour docked at the space station Friday. "We did an EVA and we did robotics," said lead spacestation flight director Holly Ridings during a briefing Saturday. "When youdo all of those things simultaneously and it all works out as well as it didtoday, it is a great day in spaceflight." The spacewalkers released the new 8,372-pound science deckfrom its berth in Endeavour's cargo bay, and cleared the way for it to be attachedonto the Kibo pressurized module. Once the platform was free, astronautsinside the space station grabbed it with robotic arms. Mission specialist Koichi Wakata and pilot Doug Hurley usedthe space station robotic arm to grasp the porch and move it out of the cargobay. They handed it off to shuttle commander Mark Polasnky and missionspecialist Julie Payette, who maneuvered the deck toward its new home on Kibo. "This was a proud moment," said Tetsuro Yokoyama,Kibo deputy project manager at the Japan Aerospace Exploration Agency. "Today is a big day." The complicated hand-off went smoothly. "You can imagine this is space, weightlessness,"Payette explained in a NASA interview. "We don?t let go until we are surethat one arm or the other is holding onto the platform itself. We call this a?handshake?." After their work on Kibo, the two spacewalkers moved on tothe space station's backbone-like truss, where they worked to attach two spareparts platforms. One of the containers, called the Cargo Attachment System, wasoriginally set up during the March STS-119 shuttle mission, but thoseastronauts had difficulty deploying it because a jammed pin refused to release. Wolf and Kopra were able to successfully unfold the platformusing a new tool built especially for the task. The cargo platform will be usedto store spare parts to be dropped off by future shuttle missions to preparethe space station for when the space shuttle fleet retires, planned for 2010. During the spacewalk the communications system in Kopra'sspacesuit sounded static-y because of a slightly misplaced microphone in hishelmet. As the ventilation system streamed air through the helmet the noise gotpicked up by the microphone, which made Kopra's communications somewhatdifficult to hear. The problem wasn't serious, though, Ridings said, and thespacewalkers managed to accomplish all their goals regardless. The issue shouldn't pose further problems because Kopra isnot scheduled to make any more spacewalks during this mission. The communicationssystems in the other spacewalkers' helmets seem to be working fine, said lead spacewalkofficer Keith Johnson. Endeavour docked at the International Space Station Fridayto begin a two-week visit, boostingthe population onboard the orbital outpost to a record high of 13. Theshuttle launched July 15 after more than a month of delays. Tomorrow the crew will conduct robotic maneuvers to begininstalling a set of spare supplies for the station. Mission managers decided it was not necessary for theastronauts to conduct a focused inspection of their shuttle's heat shield tocheck for damage incurred during launch. NASA is confident that Endeavour issafe to return home to Earth, despite the apparent loss of an unusually highamount of foam from the shuttle's external tank during liftoff that could have harmedthe orbiter if it impacted.